Mass Effect. Screenshot courtesy of the Mass Effect Wiki. Today's Pop Creature entry concludes our week-long desert themed excursion in preparation for the upcoming Mummy's Mask adventure path from Paizo. This entry details a creature from a media source the Encounter Table touched on a few weeks back, the Mass Effect universe. In Mass Effect, the thresher maws are alien creatures that populate distant worlds by seeding highly resistant spores that develop into their voracious progeny. With the advent of space travel on worlds populated by thresher maws, these creatures spores have been pollinated by travelers across many worlds beyond the desert wasteland of their origin. As such, it isn't hard to imagine one of the many extraterrestrial visitors to Golarion unintentionally (or perhaps intentionally) seeding the world with a thresher maw or two. If you put this burrowing terror up against your PCs let us know in the comments how they handled the encounter! Bursting up from the ground, this dreadful creature is a worm-like monstrosity as tall as a building. Two scything forelimbs twitch at either side of its massive, four-jawed mouth that spills forth a blue, bioluminescent tongue that drips with caustic acid. Speed 20 ft., burrow 100 ft.
Space 60 ft.; Reach 20 ft. Acid Spit (Ex) As a standard action a thresher maw may spit a viscous blob of acid up to 200 feet that explodes in a ten foot radius burst. Creatures within the area of a thresher maw's acid spit take 15d6 points of acid damage, and 6d6 points of acid damage on subsequent rounds for 6 rounds (a Reflex save DC 26 halves the initial damage and all subsequent damage from the attack). The acid from a thresher maw is highly caustic and ignores all hardness on objects its damages. Destructive (Ex) A thresher maw's claws are remarkably hard and interlaced with exotic minerals. They are treated as adamantine for purposes of penetrating damage reduction and ignoring hardness of objects. Erupt (Ex) As a full-round action while burrowing, a thresher maw can move up to double its speed and violently erupt from the earth. At the end of this movement it may make a full attack with its natural weapons and violently shunts any creatures sharing its space to the nearest unoccupied space available. Creatures moved in this fashion must succeed at a Reflex save (DC 37) to avoid being knocked prone. Additionally, the squares adjacent to the thresher maw after it erupts are considered to be difficult terrain. The space occupied by a thresher maw when it completes its erupt attack collapses into a 20-foot deep pit after the thresher maw leaves the space (a DC 15 Climb check to climb out of). Sonic Vulnerability (Ex) Thresher maws are highly sensitive to sound and suffer 50% additional damage from effects that deal sonic damage. On any round the thresher maw takes sonic damage, it loses its blindsight and tremorsense. Thresher maws are solitary creatures originating from a distant, dying world in a remote galaxy. These creatures are wholly alien, subsisting of a twinned diet. A thresher maw's primary diet is solar radiation in the form of sunlight. In order to eat a thresher maw must open its jaws and expose its bioluminscent tongue that absorb solar radiation and convert it to energy. Eating in this fashion requires a thresher maw to be exposed to sunlight and above-ground. While feeding, the thresher maw resembles a massive, alien flower in hideous bloom. A thresher maw's secondary diet consists of natural minerals which they consume while burrowing through the earth, ranging from stone to iron. A thresher maw can effectively digest any material, and these minerals are used to reinforce its armored hide and claws as well as the protective weave of their reproductive spores. Thresher maws propagate themselves by way of a spore-based asexual reproduction once in their lifetime, whereby they generate and release only a handful of spores. These spores are bristly cocoons of lightweight, fibrous metal woven inside the thresher maw's body and excreted from the thresher maw's mouth while feeding on solar radiation. 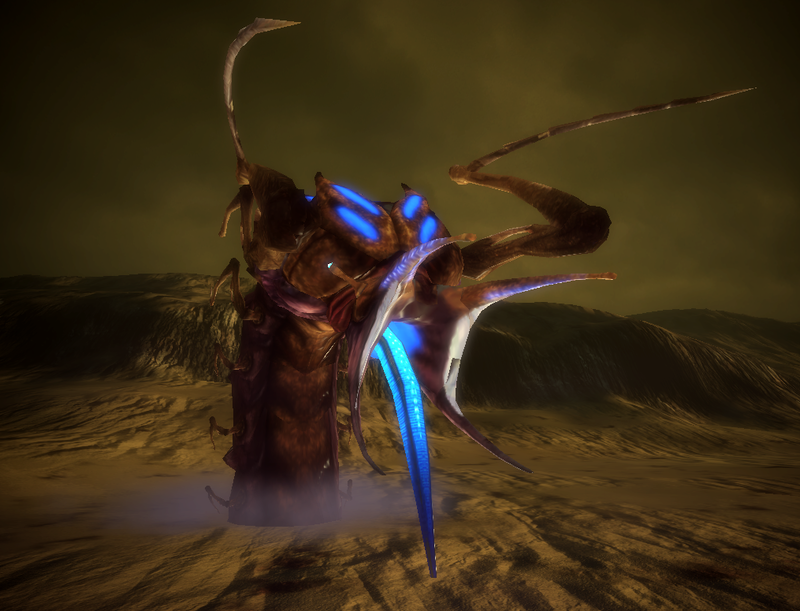 Thresher maw spores are abandoned once produced and with their light weight are often windblown across vast stretches of open land like tumbleweeds. Sometimes these spores attach themselves to objects with microscopic burrs on their exterior and are carried even greater distances. The spores themselves are highly resistant to damage (hardness 30; 45 hp) and are immune to fire, cold and acid. Thresher maw spores can even survive in the void of the dark tapestry and re-entry to a planet, allowing them to spawn their progeny across worlds. Thresher maws are aggressive and highly territorial, even to their own kind, and as a thresher maw's domain can extend for thousands of square miles they are usually encountered alone.